Burbank, CA – Growing up in South Central Los Angeles was not an easy neighborhood to be raised in. But it was through that adversity that enabled a young man to devote 40 years of his life to make an impact on a new generation. 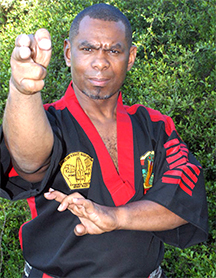 Robert Temple, a formerly Nationally Rated Karate fighter and prominent member of the Black Karate Federation, played a major role in coordinating a variety of youth programs that would make a positive impact for this and future generations. On Saturday, Feb. 6, the Martial Arts History Museum is proud to honor the life of Robert Temple. The museum will be hosting a two-hour ceremony to pay tribute to this amazing community leader. With videos about his life, his biography and the effect he continues to make, he will be presented with the museum certificate as well as honored by his family, friends, peers and all those he has made an impact on. Temple began his martial arts study when he was twelve years old and already, he was teaching his friends all that he had learned. He started competing at an early age but it wasn't until the 1980s that he excelled and became one of the most successful competitors in tournament history. He has appeared on numerous magazine covers but today he is more recognized for his continuous effort in changing young peoples lives. “The martial arts does more than teach people how to defend themselves, it instills a goal-oriented mindset and helps inspire them to succeed,” notes Robert Temple. The tribute to Robert Temple will be held at the Martial Arts History Museum at 2319 W. Magnolia Blvd., Burbank, CA, Saturday, February 6 and begins at 4 pm. Cost is only $10 for both entrance into the museum and the ceremony. Seating is limited so arrive early.